News / Sustainability & Environment / Melbourne: How you've changed in 70 years - but for the better? A website has surfaced in recent weeks which compares the Melbourne of today to that of 1945. 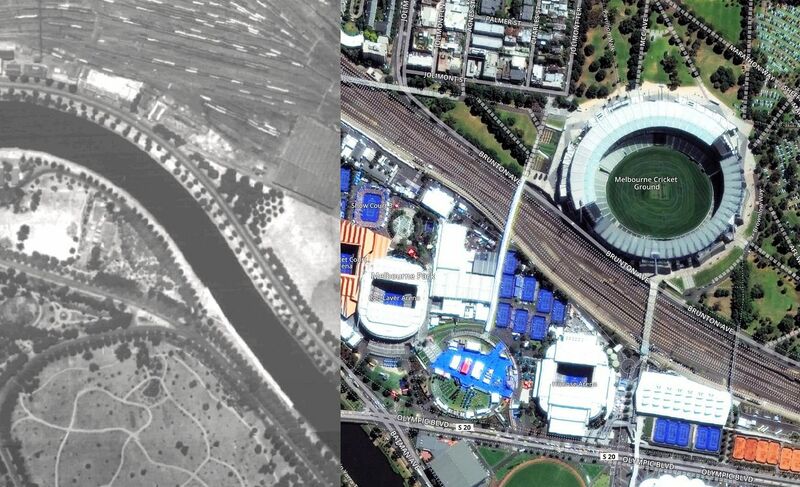 The stark differences can be viewed at Melbourne 1945 which provides contrasting aerial imagery using Department of Crown Lands and Survey photography mashed with current Mapbox capabilities. Recently highlighted in The Age, Melbourne 1945 provides a tangible resource that charts Melbourne's immense growth over a sustained period. While providing a visual glimpse at Melbourne's past, it also points toward what lies ahead for Melbourne if the current path is maintained. That is further suburban sprawl with implications for both sustainability and the environment. The aerial map of Melbourne in 1945 was commissioned by the Department of crown Lands and Survey, and conducted by Adastra Airways. This is a snapshot of the city immediately following WWII, and preceding the suburban sprawl of the postwar period. You'll notice that there are some missing portions in the 1945 map - notably the areas around Wantirna, Blackburn and Frankston. Unfortunately the original photos covering these areas seem to be lost to time. As the old adage goes, "You don't know where you're going until you know where you've been." Melbourne 1945 is an intriguing glimpse into the past while also giving a fair indication as to how Melbourne has constantly expanded since the days of its founding during 1835. This in turn poses the question: will Melbourne continue its sprawl outward over the next 30, 50, 70 years or will suburban sprawl at some point be deemed counterproductive? To think that Warburton is 72 kilometres from the CBD and still considered part of greater Melbourne is mind boggling! Will the greater Melbourne decades from now stretch beyond a 100-130 kilometre radius from the CBD? That sounds implausible, but I'm sure the equivalent was said during 1945 about locations we now consider middle and outer ring suburbs. Replicating what has been done for the past 70 years by continually pushing Melbourne outwards is not the way forward, and the Melbourne 1945 website aides by providing an excellent visual representation of what has been. Build up in a responsible manner, not outwards! Of course for the better. It is feebleminded to imply anything else. The 'marvellous' Melbourne of the 1880s that is so revered was basically stillborn, wonderful architecture but massivley overbuilt. Grand visions for Melbourne were had, overblown but at least they were visionary. TheN followed depression 1 that was so bad melbourne fell behind Sydney again and never recovered. The barest green shoots were killed off by federation, which made the country inward looking with white australia, the australian settlement, harvester judgement, ALP etc. then WWI, no real roaring 20s here, another big depression and a massive war. Post war the grand visions had gone, Melbourne another also-ran city in an also-ran country. Australia's objectives had been reset much lower than 1880 and very inward focussed. It wasn't until whitlam, keating, the opening up of Australia to outside that Melbourne has began to flourish again, though Sydney provides great competition. I sympathise with the 1880s architecture fans, and wonder if we could have kept our Haussman equivalent city intact, and built a new one from the 60s onwards in Docklands. Too many mistakes were made - the City Loop, Docklands Stadium, the Monash Freeway along the Yarra and the closure of Sturt St and lowering of City Rd, and of course building Crown along the Port Melbourne rail easement. Overall though, a much better city than 1945. I believe you've neglected the point of the article. Urban sprawl unchecked into the future will be highly detrimental to the overall livability of Melbourne - or so I'd assert. A ridiculous assumption, in 1945, the same argument would have been used. I think you've missed the point of your own article Mark. Or rather missed your mark. Comparing post 1945 suburbs with what ...farmland? Not sure what the issue is. Some of these suburbs were poorly planned but so were plenty of pre 1945 ones. 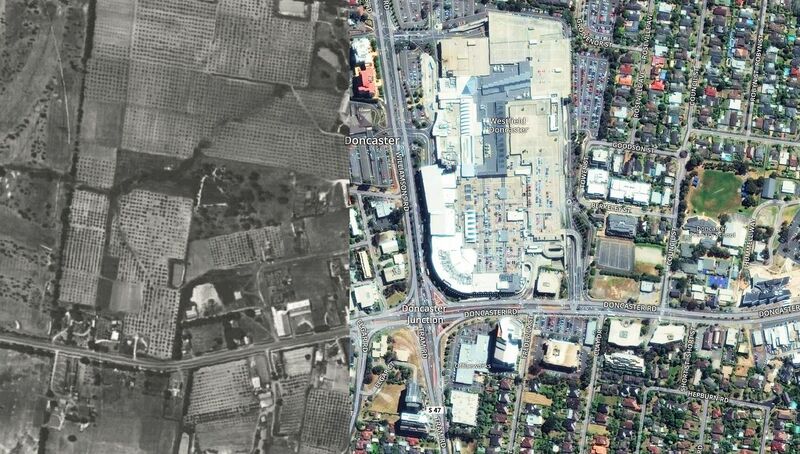 The only value of the old photos is to see the developed areas of both eras, not the farmland. Despite many transit fans not getting it, the reality is melbourne's sprawl was created by the rail system. Places like Lilydale or Hurstbridge should not have had any significant development before 1990 at least, yet the unnecessary expansion of electric rail to these areas made development a safe if disasterous political option. Made now much worse in the case of Pakenham. I'm genuinely surprised by your pro-heritage assessment of Melbourne, Riccardo. We did have a kind of 'roaring '20s' here, though - at least architecturally speaking. The grand 1920s and '30s Picture Palaces of Melbourne speak to that - consider the unique Capitol Theatre, The State Theatre with it's twin Wurlitzer consoles (now the Forum), The Regent, the Palais St. Kilda and the Hoyts Deluxe. All were amazingly overblown fantasies comparable in scale and extravagance with similar structures built overseas at the time. You should be not surprised that i like architecture. I like lots of things. Bur i do believe the beneficiaries of good architecture should pay for it, rather than forcing the owners of buildings to keep them if they don't want to. Why did we never go down the La Defense route? We had no economic 'roaring 20s' or any overflow of a booming economy into culture. No great gatsby here. No long island mansions. What money there was for development was put into more sprawl, and the new suburbs which are chrished now but were probably moaned about then. Why would anyone catch a tram all the way to Wattle Park?